After fleeing from Nu-Eden in an effort to escape the lure of the entity who calls herself Xandra, Rob Cameron and his fellow fugitives land on Iceworld, the fifth planet in a distant star system the humans are trying to colonize. Hoping to find sanctuary and start a new life with Valissa, the young woman he loves, Cameron and the others join a small group of stranded scientists in their research station. When a couple of the men decide to go in search of Regina Seagull, one of the scientists who has been abducted by a group of alien savages, Cameron accompanies them into the dark tunnels below the surface of Iceworld. The three men find an alien world in the huge caverns underground and they discover more than just monstrous creatures and Shadow-dwellers. The rush of air entering the space shuttle through the open airlock sent shivers down Rob Cameron’s back, not only because the air was laden with ice crystals, but also because it made him realize he was finally free of the Xandra. 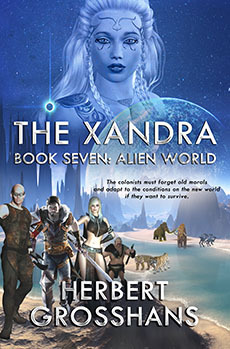 He and twenty-one men and women, fled Nu-Eden, the fourth planet in this star system, to escape the influence of the alien entity who called herself Xandra, the Great Mother. They had left Paradise. What would they find on the fifth planet? Would they find the freedom they sought or would this cold planet turn out to be another hell? Everyone was anxious and excited, and eager to join the men and women already living in the research station. The screen in the front displayed the outside world with sharp clarity. There wasn’t much to look at. Only an oval building like a silvery huge egg dropped onto the thick blanket of snow by some monstrous bird. It lay silent and foreboding, without any signs of life, surrounded by an endless expanse of white, as if waiting for the hatchling inside to break through the shell and climb into the cold, barren world outside. Cameron shifted his attention to his companions. After spending more than a week in the cramped quarters of a spaceship traveling from Nu-Eden across the dark void of space, he assumed everyone would be eager to leave, but it seemed nobody wanted to be the first one to abandon the cozy warmth and safety of the shuttle. He couldn’t blame them. What waited for them did not look inviting. “Last time I was here, there wasn’t any snow. In fact, this whole area was covered with lush grass and there was no ice on the lake. I have a feeling it’s colder here than we expected it to be,” Ferd Prowler said, breaking the silence. He was the shuttle pilot who had brought them safely to this planet. The tremendous amount of electrical interference and buffeting winds in the upper atmosphere had made it a rough ride. Most of the piloting was done by the shuttle’s artificial intelligence. The AI took over automatically when it judged it necessary. No human pilot, no matter how capable and skilled, would ever dispute the computer’s decision. Prowler’s job was in reality only a backup position. Cameron chuckled. He would never tell him that. Prowler took his job seriously and didn’t like criticism. “What’s that giant egg we see beside the lake?” Conrad, the younger of the Hudson-brothers spoke from behind Cameron. “You built that?” Sigmund Hudson spoke with respect in his voice. “I sure did.” Armand gave another little chuckle. “Not alone, mind you. I was here last year with my crew. Some of them stayed behind when I left. They’ll be surprised to see me.” His eyes looked thoughtful. Her hazel eyes showed her fear, but she smiled bravely. “I didn’t think it would be this cold.” She hunched her shoulders, shivering. People were finally suiting up for the cold. Cameron retrieved his and Valissa’s backpack from the overhead compartment and pulled out his suit. “You heard the man. Better get dressed for the occasion,” he joked. Valissa removed her suit from her pack and stepped into the wide legs. Slipping into the upper part, she tucked her ponytail into the loose-fitting hood and pulled it over her head. Then she sealed the front of the suit by overlapping the magnetic strips. “I wish this suit wasn’t so big,” she complained. Cameron smiled back at her and gave her a wink with the eye Valissa couldn’t see. “You have good ears, Mrs. Hudson. Perhaps I’ll have to lower my voice when you’re around. My lizard dips into only one well, no matter how many others may be available. I have moral standards, you know.” When he looked at Valissa, he saw the rosy color on her cheeks. Putting his arm around her narrow waist, he pulled her close. “With you?” Valissa said softly. “Why would they not be happy to see us?” Valissa looked puzzled. They moved down the aisle, following the other passengers. Some had already left the shuttle and were climbing down the narrow ladder. When Cameron reached the exit, he looked down and saw a few people struggling in the deep snow. “We should have brought snowshoes,” he said to Valissa, who stood behind him, peering over his shoulder. “And get yourself lost in the meantime.” His mother’s comment dampened his enthusiasm. Cameron shouldered his backpack and began climbing down. Valissa was close behind him, followed by Teresa and her two sons. When Cameron jumped off the last step, he sank nearly up to his crotch into the snow. Some of the people already at the bottom laughed, while others cursed loudly, fighting with the white stuff, using their hands to dig themselves out. Cameron looked around to see Gordon Rockwell making a trail away from the shuttle. Rockwell was a big, powerful man, but even he struggled to free his legs. “I don’t think I’ll have the strength to make it that far through this deep snow,” Claudette Lavallee complained, staring at the distant research station. Her husband Ron Lavallee snorted and tried to follow Rockwell. “If you were a real man you would offer to carry my pack,” his wife said. He stopped to look back at her. “Sure, I’m good enough to carry your pack,” Lavallee sneered, “but not good enough to share your bed. You seem to be doing fine without me. Carry your own pack.” He turned away. “Didn’t you bring a sled on board, Rob?” Valissa said to Cameron. Malone disappeared back inside the shuttle. As everyone waited, Teresa and her sons joined the group. She laughed when she couldn’t pull her feet out of the snow. “This looks like more fun than I anticipated,” she said, her voice laced with a hint of panic. Cameron recognized Natalia Laroche, one of the young women Armand had persuaded to come with them to this planet. Her friend Megan Monias came down the ladder a few moments later. Pausing at the top of the ladder, she studied the snow. “I like to work out but this is not what I expected.” Then she laughed and tumbled into the snow beside Natalia. A few of the men had trampled down much of the snow by now and it was easier for everyone to move around. It didn’t take long to clear an open space in front of the shuttle. Cameron shrugged off his pack and climbed back up the ladder and into the airlock. “Activate the power unit,” he told Malone. Cameron climbed onto the sled and lay down, his head toward the front where the controls were located. Sleds were meant to float close to the surface. This high up there was a chance it could dip to one side if he wasn’t careful. “Go ahead.” Cameron had his fingers on the two levers on each side of the small control panel. Malone pushed the sled carefully out of the lock. It wobbled a little when it slid into the open, but Cameron managed to steady it after a few precarious moments. Slowly decreasing the power, he made the sled sink lower until it floated only about a meter above the snow-covered ground. Sliding off the sled, Cameron let out the breath he’d been holding. They began loading their packs onto the floating platform until it was filled to capacity. Rockwell offered to pull the sled behind him. He was a big, strong man, but his strength was not really necessary, because even loaded up, the sled was easy to pull. It floated on a magnetic field and moved easily in any direction. Everyone had left the shuttle by now, except for Prowler. After shutting down the engines, he climbed down the ladder to join the people below. Armand and Malone, also big men, walked ahead of Rockwell to make a trail. Cameron and Valissa walked close behind the sled. Progress was slow, but nobody complained, because everyone knew Armand and Malone had the toughest job of them all. Once the trail was made, walking for the people behind them was fairly easy. “I think I like walking in a field of high grass much more than this,” Valissa said beside Cameron. “They’re dropping lower,” Valissa said. Everyone stopped moving and watched the two shapes in the sky. Cameron didn’t miss the anxiety clearly visible on everyone’s face. “Are they dangerous?” Naomi Lewis stood not far behind Cameron, next to her sister Gabriella. He squeezed her hand. “If nobody lives in there we’ll have the place to ourselves,” he joked, but he shared Valissa’s fears about the creatures in the sky. They looked like birds, but were they?